Be recklessly generous and relentlessly kind. Let me be the first to congratulate you! You just found the link for Create or Die!!! You Know You’re in Kansas When…..
More scientific proof that we are all one. You might remember the 101 Dalmations experiment in E-Squared? The premise was that you are connected to everyone and everything through an “invisible” field of intelligence and energy. In quantum-speak, this lattice of connections is called entanglement. It’s the scientific explanation for why your thoughts create your reality. It’s why setting intentions draws material things into your life. It’s why synchronicity, a phenomenon people regularly shrug off with a “Wow! What a weird coincidence,” is proof of the interconnectedness of all things. It’s why in this illusory us-versus-them world we, as the spiritual principle states, are really one. Our differences, as huge as we make them out to be, are superficial and meaningless. And it’s time we let them go. In a new study in the journal Science, Jian-Wei Pan, a physicist at the University of Science and Technology of China in Shanghai, proved entanglement works even when photons are 300 miles away. A satellite orbiting 300 miles above the planet beamed entangled particles to two different ground-based labs that were 750 miles apart. Even at that great distance, they didn’t lose their rock-solid linkage. It’s the first time anyone has ever generated entangled particles in space, and represents a 10-fold increase in the distance over which entanglement has been maintained. Quantum entanglement seems to break the bedrock rules of standard physics: that nothing can travel faster than light, that objects are only influenced by their immediate surroundings. And scientists still can’t explain how the particles are linked. Is it wormholes? An unknown dimension? Yet even though nonlocality doesn’t make sense to our Newtonian brains, we can use it to our advantage. Like your computer that is hooked up via the Internet to an infinite amount of information, you—by virtue of being a human being—are hooked up to everyone else in the world. So the real question is not how does this work, but what do you want to manifest? What do you want to use your thoughts to create. More of the same? Or something new? Something exciting? Something that uplifts the whole planet? You can use entanglement to draw love into your life. You can use it to brighten the world. You can literally uplift your world by lasering love, blessings, peace, and other high-frequency emotions to the people in your life. I don’t know about you, but I can’t think of a better use of my thoughts. Pam Grout is the author of 18 books including E-Squared: 9 Do-it-Yourself Energy Experiments that Prove Your Thoughts Create Your Reality and the about-to-be released, Art & Soul,Reloaded: A Year-Long Apprenticeship to Summon the Muses and Ignite Your Daring, Audacious, Creative Side. Hope you’re awesome as always. I am great too, thanks to these weekly dosage of awe-inspiring newsletters of yours in some ways. It’s been what, a year or two maybe, since I subscribed to your newsletters. Yours is one of the only 3 letters I wait to read every week. Can you believe that? I am proud to say I haven’t missed one. And how could I be not? You are the only blogger I have ever known who, by some stroke of genius, manages to talk about spirituality, science, manifesting miracles, exotic travel experiences, and what not. How does that even happen? And I would like to say that your newsletters have played an important part in this mind-changing process. In case you’re wondering about the reason for this sudden outpouring of sappiness; I just reached a goal – financially – which I would NEVER have even thought was possible for ME 6 months ago. And as I was still basking in the afterglow of my successful achievemnt – “Ping”, it was time for your much beloved newsletter! Here’s to your future words 🍷 I look forward to reading your happiness-infused-magic-embedded newsletters for a long long time. Wow! Thanks for the kudos! Much appreciated. Oh my oh my, just as I read Shirley’s comment about lasering love, the exact same expression almost to the miinute was said as I was watching a tv show..wowsa!! Bring it on! And of course trickling down through your expression of lasering, I just love how we have connection on this planet. Pam, you are my mentor, my hero and I love everything you bring. You create such a peace in my soul and heart. Thank you for sharing this. I wish we could get some world leaders to understand this. I’m not the sharpest crayon in the box but even I get it. You certainly sparked my day. blessings, love & joy to you. A beautiful snapshot of the Quantum World– I shared it on Facebook and hope it will be shared widely. Ah something we’ve known all along…….still its good to get scientific proof for all the doubting Thomases out there. Yes, you are truly right, and these studies are great for the fact that they acknowledge not just my own, but my clients experiences. Not only that, but your thoughts influence the way you think, act and behave, with, even if not a sudden, but a gradual unfolding of a transformed life is made possible. The avenue to which my institution delves deep into this phenomenon and accelerates ones own experience in this truth is through meditation.. Please feel free to click the link by my name to learn more of this methodology. Thank you Pam for bringing this topic to light. Read Lynne McTaggart’s book “The Field” for much more on this issue of Entanglement. What? You haven't downloaded my amazingly cool I-Phone aps yet. 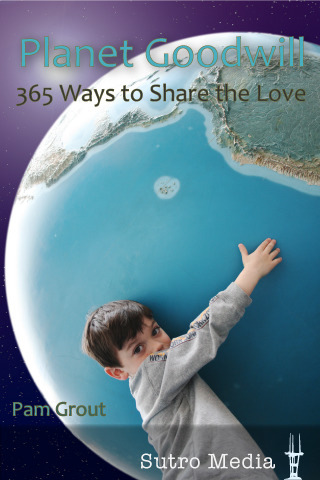 Planet Goodwill: 365 Ways to Share the Love offers a good deed a day with lots of pictures and ideas for everyday gallant acts. Camp Nashville is a zany scavenger hunt of Music City, complete with prizes. 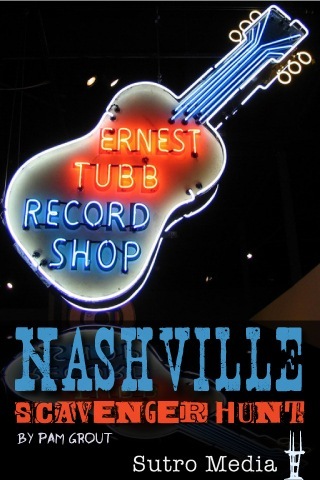 First to snap a photo at all the required (and fun) stops wins $1000 worth of Nashville prizes. "Your book is beyond spectacular. It's funny, uplifting, delightful and profound. I am ordering six copies for my daughters and their friends. You rock, the book rocks, and so, of course, does Cosmo K."
“In the parlance of today's youth--I think you are the bomb! It's called George Clooney Slept Here. It's all about resorts, spas and hideaways frequented by the unapologetically wealthy. It's fun. It's sassy. And it's easily found by clicking here. Enjoy!! !